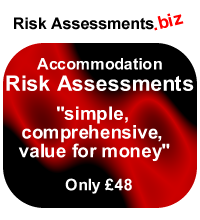 We specialise in risk assessments for self-catering accommodation, guest houses and B&Bs. Running a small business in the tourist industry is time consuming and the profit margins are small. Taking the effort out of health and safety is important. If you are new to the industry and require the services of our small business package, it will be ideally suited to your needs. We will make sure that you have met all your basic obligations and have the necessary policies and procedures in place. If you have been in business a while, then the Safety Audit within the small business package may be just what you need to feel confident moving forward. Our sister company provides on line risk assessments for tourist businesses. Unlike most on the market, our online risk assessments are not blank pro formas that leave you just as bewildered as when you began. They are a series of questions with guidance notes that walk you through a thorough assessment of the hazards associated with your business. They are simple and easy to complete and meet the requirements for registration with Visit England and Official Tourist Board sites that require copies of risk assessments before you can join. "We have used the risk assessments devised by The Health and Safety Consultancy for our cottage in the Cotswolds and are impressed by their simplicity and completeness"